Only 24 days left until the Central American and Caribbean Games in Barranquilla, Colombia. Rugby will be played on August 1st and 2nd so teams like Jamaica and Mexico can participate in the RWC Sevens as well as this tournament and I imagine of them win. The matches will be played at the newly renovated 3000 seater Estadio Moderno Julio Torres. I will be there for the last week of the tournament and definitely going to watch some rugby. I managed to get a press pass through my BIL so will be taking pics and possibly interviewing anyone who speaks English. The duel with Cayman, a sort of continental final, will be not so easy for Usa South: the Cayman are going to field a fijian as first centre and a Stringer as scrumhalf! This game will take place Saturday 7th July, 1pm at Old White Rugby Facility Atlanta, GA. RAN championship must be re-thought, even if I don't know in which way. 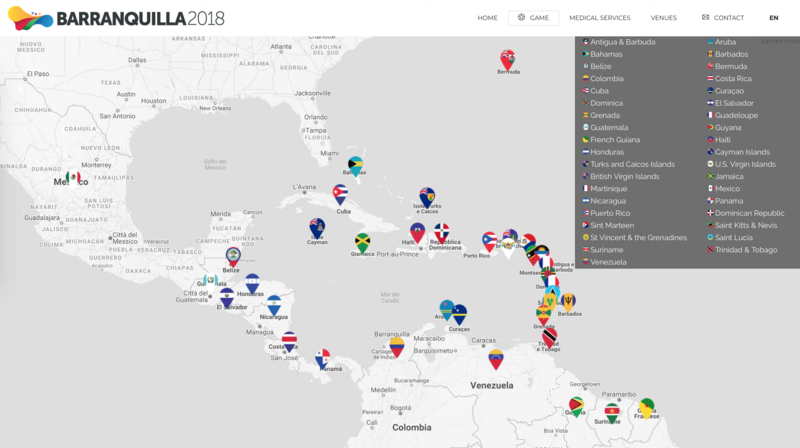 A tournament without Canada, with USA fielding a regional selection, without the other-best-teams Mexico and Guyana, with the candidate winner T&Tobago forfeiting due to lack of funds, has not the stigmata of a continental championship. The match between Usa South and Cayman was a sort of final for the title but it was not televised nor (as far as I know) web streamed and it's even hard to find photos of the game, several hours after its end. I feel like having Canada and the USA compete with the likes of Cayman Islands would be futile. I wonder if it'd be worthwhile to include CRC teams (for Canada) and GU rep teams (for the US). I'd love for the Central American teams to join RAN. Nothing is clear until we understand how the Americas Challenge will work. Guyana and Mexico will play it - how promotion/relegation will operate? grande wrote: I feel like having Canada and the USA compete with the likes of Cayman Islands would be futile. I wonder if it'd be worthwhile to include CRC teams (for Canada) and GU rep teams (for the US). USA South is a Geographic Union rep side, it's not even the Eagles Selects. To be honest I'm unsure that you would classify them as even a 3rd tier side if it were in the national set up here, especially now with MLR. Yep, I'm aware. I was (kinda/sorta) suggesting adding more GU rep sides to the tournament. victorsra wrote: Nothing is clear until we understand how the Americas Challenge will work. Guyana and Mexico will play it - how promotion/relegation will operate? In all seriousness though, I would like to see the winner of the ARC B (Challenge, calling it B because they're both ARC) play a 1 or 2 game playoff against the loser of the ARC A in November or February (if the ARC A is moved). I do not want to see an automatic promotion just based off winning the ARC B - if this is case then the ARC B winner could just have gotten lucky playing against a very weak ARC B and could be just have a revolving door of ARC B to A and back again every year. This also gives an extra 2 guaranteed test matches for 2 lower tiered teams who most definitely do not get this opportunity. If there is no playoff then I would rather see this happen every 2 years and allow for aggregate score over those years. So if Paraguay wins the ARC B and Chile loses the ARC A, then they would square off for a match or two to see who gets to be in the ARC A. AFAIK, neither team consistently have November test matches so this would be a very welcome addition no matter who wins. I don't think Paraguay is better than Chile nor do I think they would contend very well in the ARC A so an automatic promotion would just result in them getting smacked and Chile owning the ARC B. Sure it'd be good experience for some of the teams involved but I'd rather see top notch competition. USA South Women win RAN 10s. 19-12 over Jamaica. Men U19s is tomorrow, USA South has a chance for a full sweep. Los Serpientes U19s 46-15 USA South. Great crowd on the home side of the stand...maybe RAN can shift their filming angles next time? The schedule is already set, however it doesn't list any of the teams involved. There are 2 pools and 12 preliminary games so I would imagine that there are 8 teams involved. This page on Wikipedia says that Colombia, Venezuela, Jamaica, Mexico, Guayana, Trinidad and Tobago, Guatemala and Costa Rica are the 8 teams. Watching the map above I noticed for the first time in my life (even if I'm almost 200 years old) that El Salvador, Nicaragua and Honduras have very similar flags. This leads to the suspect that they were once together a one only state and the hypothesis is more or less correct, Wikipedia says: almost two centuries ago those three nations plus Guatemala and Costa Rica formed PUCA, a federated state (Provincias Unidas del Centro de America), but after just two decades the federation collapsed due to internal disputes and wars. Anyway most of the territories maintained the PUCA's blue-white-blue flag also after the de-federation. Tobar wrote: The schedule is already set, however it doesn't list any of the teams involved. There are 2 pools and 12 preliminary games so I would imagine that there are 8 teams involved. Canalina wrote: Watching the map above I noticed for the first time in my life (even if I'm almost 200 years old) that El Salvador, Nicaragua and Honduras have very similar flags. This leads to the suspect that they were once together a one only state and the hypothesis is more or less correct, Wikipedia says: almost two centuries ago those three nations plus Guatemala and Costa Rica formed PUCA, a federated state (Provincias Unidas del Centro de America), but after just two decades the federation collapsed due to internal disputes and wars. Anyway most of the territories maintained the PUCA's blue-white-blue flag also after the de-federation. Yeah I wish there were more but rugby is so far down on the list for these countries. Jamaica or Mexico should win pretty easily against most teams. Colombia have a great player in Jhon Arley Urrutia. He's wicked fast and plays 15s too as a wing but doesn't have the best rugby IQ. Typical 7s player, not sure how big he is but he is pretty damn muscular so he's not a Perry Baker kind of build. It also looks like ARN confirmed the teams as well: https://www.americasrugbynews.com/2018/ ... ean-games/. 8 Men's team's participating in the Central American and Caribbean games. Playing 3 games each to sort out the Quarterfinals etc for tomorrow. High hopes for Colombia. They’re surely getting better but I’m not sure they’d get gold. This is 7s though and these teams don’t get regular playing time like those on the circuit so anything can happen. Wonder how Jamaica’s new guy is going to do. Why Guyana behind Guatenala or Cosrfa Rica or Trinidad? They have much better results. Guyana will play for the bronze. Even maybe for the silver. Venezuela in theory could play to be in the SFs, cause they are not behind Guatemala or Costa Rica, but I guess the crisis is hitting them. I haven't seen Guyana played in a long time unlike the others but will see after today where are the standings. Venezuela is that low because of the current crisis but they may surprise us. The only undefeated men’s team is Trinidad. Colombia beat Mexico which war Guyana which beat Colombia, so its completely up in the air right now. Colombia is playing Guatemala in the QF and they should be able to handle them easily (Guatemala is winless). As for women, Colombia and Venezuela are undefeated and both look pretty good. That’d make for a fun final. Mexico is 1-2 which surprised me considering they were at the RWC 7s. Also, did not expect the French Guyanese team to be completely white guys. Tobar wrote: Also, did not expect the French Guyanese team to be completely white guys. There is a big European space center in Kourou. Mexico they just hammered Venezuela, this tournament is most definitely up in the air. I still think Colombia will take Men's Gold. Where pretty much everything gets launched. I spent time in Kourou, nicer than Cayenne personally. Interesting that the way the French make pizza is the exact same. Also, something dumb was your M&Ms would be imported to France and then shipped to Guyane Francaise.